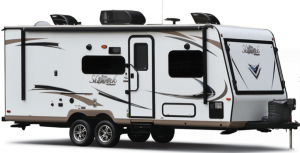 The exterior features of the Shamrock provide you with a durable recreational vehicle that comes with Vinyl / Rubber Composite Roofing Membrane, Radius Roof w/ Interior Vaulted Ceilings, and Insulation Factors R-7 Side Wall, R-12 Floor and R-14 Ceiling. It also comes with an Easy to Reach Lockable Bed Latch System and Magnetic Compartment Door Catches. You’ll be glad to hear that it has Laminated Fiberglass Sidewalls and if you want, you can order the optional Laminated Oyster Colored Fiberglass Sidewalls. In addition to the Electric Slideout that allows your family to enjoy all of the space they need, you’ll love that it has a Friction Hinge Entrance door and an optional Awning Slide Topper. And of course, one of the best features if you have kids–the Outdoor Shower! Every family loves this feature, as it keeps the dirt where it belongs: outside! When it comes to the interior of any RV, there are certain amenities that you personally will love more than others. With the Shamrock, there are multiple amazing features that you will love equally! The Driftwood Interior gives off a warm and cozy atmosphere. It also gives the optional Maple (with Solid Maple Glaze Finished Cabinet Doors) Interior, as well. This includes Screwed and Glued Wood Cabinetry, which is a beautiful touch to the design aspects of this expandable! In addition to the style, it also is convenient with the Residential Full Extension Metal Drawer Guides, Engineered Mold and Mildew Resistant Floor Covering, and the Ducted Furnace. Don’t worry, it also comes with a 13,500 BTU Ducted Air (N/A 183, 19)! There are options to obtain heated theatre seats on some of the Forest River RV Flagstaff Shamrock floorplans, as well as an optional Deluxe Tri-Fold Sleeper Sofa (per floorplan). 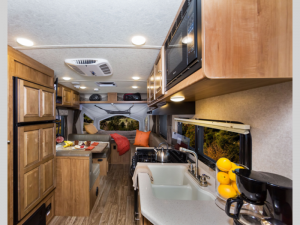 In addition to these features, the Shamrock provides an Extra Maxxair® Ventilation Fan and Vent Cover, a Heated Mattress to stay warm in the chilly fall evenings, and a WiFi Ranger WiFi Booster for rainy days when you’re stuck inside! If you’re interested in learning more about the Our Forest River RV Flagstaff Shamrock Expandable for sale contact us, We’re here to help you find the best RV for your needs and answer any questions you have!